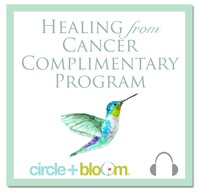 Circle+Bloom™ in collaboration with Rosanne Austin presents our free monthly fertility teleseminar by providing you with a great opportunity to do a deep dive into the topics that will support you to live your fertility journey with more ease and less stress. Each 60-minute teleseminar is our gift to you and will offer a highly interactive combination of great education and access to powerful support. Join us for our next teleseminar 3 Critical Skills for Creating Your Fertility Success Story on March 16, 2019 at 10:00 AM California/1:00PM New York/5:00 PM London. Click here to listen to the replay of all of our teleseminars. Fertility Hour Podcast: Healing Infertility By Harnessing The Mind-Body Connection with Joanne Verkuilen. 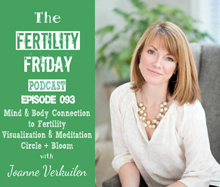 The Fertility Friday Podcast: Mind & Body Connection to Fertility, Visualization & Meditation for Fertility – Circle + Bloom with Joanne Verkuilen. Beat Infertility Podcast: Visualization for Fertility Success with Joanne Verkuilen. 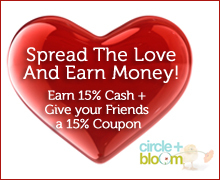 Receive 15% off Circle+Bloom Fertility Programs when you join Circle+Bloom’s NEW Referral Program. Receive $9.95 off M Plus B, PreNatal Plus Vitamin. M Plus B is a Prenatal Vitamin PLUS DHA, Acai, & CoQ10 specifically formulated with the concentrations of vitamins & other crucial ingredients needed by women who are trying to conceive or are pregnant. One tablet Once a Day, 90 tablets (90 day supply). FREE Shipping. Full Refund for any reason if not satisfied. Enter coupon Your Fertility at checkout to receive $9.95 off. Save 10% off on any purchase of 3 or more pouches of Jade and Jo Harmonize It Fertility Teas. Jade and Jo Harmonize It Fertility Teas combine the finest organic herbs and botanicals to help regulate hormones and support overall reproductive health for the entire duration of your menstrual cycle. Each blend contains ingredients that are chosen specifically to support the four distinctive phases of your cycle. Our combination of eastern and western nutritional philosophies and ingredients are based on the latest research and are complemented by time-tested Asian herbal formulas to enhance conception. Enter coupon code THREEPLEASE. Save 15% off on Complete Conception, FertilPrep, Male FertilPrep, Nausea Relief and Essential Balance Oil. Enter coupon code Bloom15. Pay No More Than $20 with Prenate’s New eVoucherRx™ Program. Receive $10 off Spermcheck Fertility, a simple and reliable, FDA-approved test, done in the privacy of your own home, which can quickly inform men as to whether their sperm count is normal or low. Early-Pregnancy-Tests.com a large web retailer of preconception products from pregnancy and ovulation tests, fertility monitors, basal thermometers, vitamin supplements, is offering a 10% discount on their pregnancy and ovulation test strips. Use promotion code BFP4ME at time of check out to receive the 10% discount. Fairhaven Health is a leading supplier of fertility and pregnancy related products, their products include FertilAid fertility enhancing supplements, FertiliTea, Fertile Focus Ovulation Microscope, and more. Use promotion code yourfertilitydeals at time of check out to receive the 10% discount on all their products except the OvaCue, Fertility Monitor and Pre-Seed. Receive 10% off Fairhaven Health OvaCue Fertility Monitor. Enter promotion code ovacue at time of checkout. CLICK HERE TO SHOP. 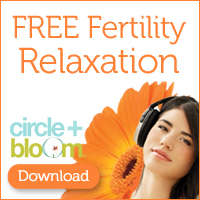 Start your fertility journey with Circle + Bloom today and explore how a simple audio mp3 file can help you. Reduce stress and open the powerful mind-body connection, by making incredible strides to improve your fertility and overall health and wellness. 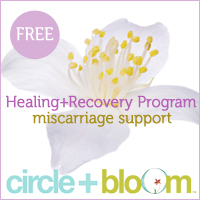 Circle + Bloom Healing + Recovery Program is designed to prompt you with questions or statements to help you reflect on your journey and what you have gone through with your miscarriage providing you with some measure of comfort and healing. If you have suffered a miscarriage or other traumatic event; are feeling sadness, grief, anger and pain; recently undergone a D&C or other procedure, or any combination of the above, then this program should be your next step in your healing journey. 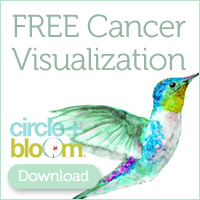 Download our free cancer visualization program to leverage the power of the mind body connection and cancer visualization for all stages of cancer diagnosis and treatment. Take control today. The Hope for Fertility Foundation located in Utah provides fertility grants to couples across the United States. 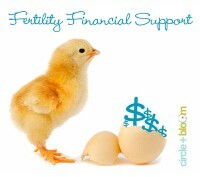 Our goal is to help couples overcome the financial barrier of going through fertility treatments. Parental Hope provides infertility awareness and financial support to hopeful couples battling infertility through the Parental Hope Family Grant. Since our inception in 2016, we have awarded three Grants for full rounds of IVF and one of our recipients is currently pregnant. Maverick’s Miracle Babies Procreation Grant is to be used for medical costs surrounding IUI and IVF procedures. Each grant awards up to $20,000 per couple. Once a child is conceived, all remaining funds will return to the procreation grant fund to be used for another couple. Grant is awarded four times a year. Grant deadlines are Q1: December 31st, Q2: March 31st, Q3: June 30th, and Q4: September 30th.Click here to apply! Pay It Forward Fertility Foundation is a non-profit organization in North Carolina offering grants for IVF in various states. Proposed new application cycle #2 start date: April 2, 2018. Proposed new application cycle #3 start date: July 2, 2018. Baby Quest is a charitable organization whose goal is to grant financial assistance to those who cannot afford the high cost of procedures such as egg donation, IVF and surrogacy. Baby Quest next grant deadline is May 23, 2018. Click here to apply! 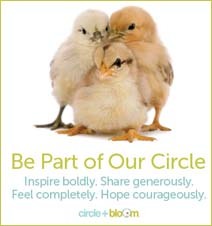 Circle + Bloom’s financial support program for Women’s Health and Fertility is still very much in the early stages, which is good because that means you can help form what this support program actually becomes. For starters they have set aside a fund to help offset up to 60% OFF the cost of their programs. Click here to apply! 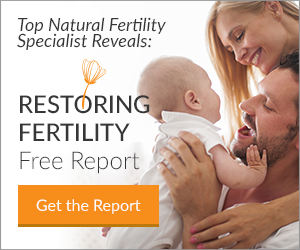 Iva Keene, an award-winning naturopathic doctor who takes a holistic approach to increasing your fertility authored a 39-page FREE report that highlights the most effective strategies she’s discovered for increasing your fertility naturally, based on scientific evidence. In it, you’ll learn topics like: 3 Common (And Costly) Mistakes About Natural Fertility, The Scientific Evidence For The Importance Of Preconception Care, The Top 6 Environmental Toxins To Avoid, A 7-Step Fertility Cleanse, and Why Living A “Healthy Lifestyle” Might Not Be Enough To Get Pregnant. Click here for your FREE report. The Natural Fertility Company is extremely excited to announce the launch of our one-of-a-kind community, Natural Fertility VIP. 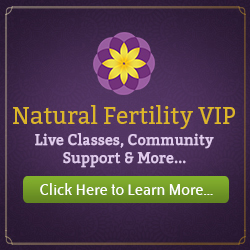 Natural Fertility VIP is a community of women coming together to uplift and support one another, while receiving expert fertility education, expert classes, live support and professional guidance. Women from any part of the World can sign up here. 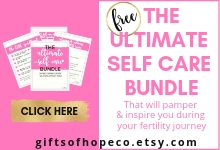 FREE Ultimate Self Care Bundle from Gifts of Hope Co.
Free Ultimate Self Care Bundle from Gifts of Hope Co. will pamper and inspire you while you are on your fertility journey. You will get a free 11 page guide packed with love including: 23 self care ideas without spending money, relaxing & calming detox bath recipe, how to create a mantra that will manifest, 12 self love affirmations, mandala coloring page to help you de-stress, and how to create a vision board that attracts what you want. 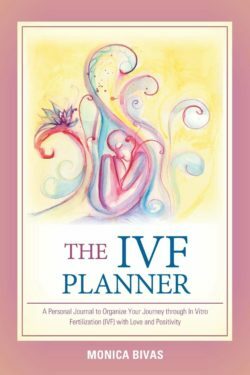 Monica Bivas has released a new book that is a perfect tool for anyone going through an IVF Cycle or ready to start one. Her warmth and positive approach from her own fertility journey and challenges lends well to helping you walk this IVF Path with strength and hope. “She has created a remarkable book that skillfully combines loving attention, positivity, practical wisdom and a deep sense of how to approach IVF in a less stressful way to help women and couples struggling with fertility issues achieve the positive outcome they seek” as best selling author Sharon King describes her book too. And, she has an integrative body-mind-soul approach which I truly admire and appreciate. This is a must have for anyone going through an IVF cycle. You can purchase it here: Amazon, Barnes and Nobles, Balboa Press. Have your doctors been running the right hormone tests to determine how healthy your hormones are or explain why you haven’t been able to get pregnant? Functional diagnostic nutrition practitioner (FDN-P), Kristin Thomas of Thrive by Food is a certified expert hormone specialist who runs the most advanced hormone lab test on the market, the DUTCH Complete test, which tests for ten estrogen markers, four androgen markers, three progesterone markers, your cortisol stress response, B vitamins, neurotransmitters, and much more. This gives you a complete picture of your hormone health, giving critical insight into your fertility and ways to rebalance it naturally. Contact Kristin for $100 off the DUTCH hormone test plus a $50 discount on a single session to work with Kristin for a FULL analysis of the results plus recommendations on what to do. Receive a FREE fertility assessment consultation and 20% discount on “Jump Start Your Fertility Program”. The FREE Fertility Assessment Consultation helps women gain clarity about their fertility situation, what’s holding them back, and what their next step should be. Regular price: $500, w/ 20% discount code: circlebloom20 only $400. Please mention the coupon code when booking your appointment. Misty Reed has helped 100’s of women and couples achieve their dream of getting and staying pregnant using a unique approach of Traditional Chinese Medicine and Western Medicine knowledge. She creates treatment plans for her clients that include recommendations for diet, supplements, acupressure, lifestyle, exercise, and other complimentary therapies as needed. Tired of all the conflicting fertility diet information? 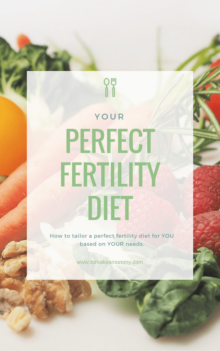 It is up to YOU to take control of your fertility journey and do the research to figure out YOUR perfect fertility diet. 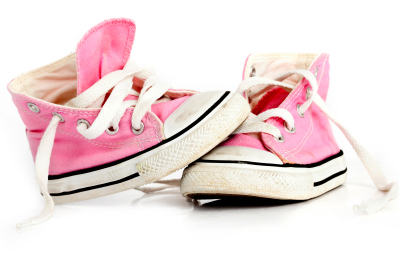 Anna, a blogger at tomakeamommy.com developed this free e-book as a guide to jumpstart the process. It includes tailored diet information for many infertility diagnoses, such as PCOS, Endometriosis, Anovulation, Luteal Phase Defect, Thyroid Problems, Fibroids, Unexplained Infertility, and more! Click here to download your free e-book. 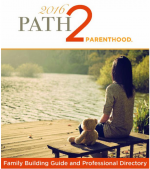 Path2Parenthood’s Family Building Guide has been meeting the needs of hopeful parents for over 20 years. Containing an extensive listing of providers across all specialties in every state, the Guide is filled with comprehensive and useful articles written by experts, addressing all aspects of family building. Download your FREE copy today! 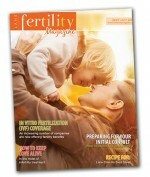 Lane Fertility Magazine is published twice a year in print and as a digital edition. Their mission is to increase awareness among young women about their fertility and to serve as a resource for women and men undergoing fertility treatment. Download their latest edition. 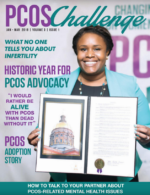 Download your free copy of Jan-March 2018 PCOS Challenge Magazine today or view it online. Fertility Friend “Charting Your Way to Conception [Kindle Edition]“ will teach you how to identify your fertility signs, find out when you are fertile, see if and when you ovulate, and how to use your fertility signs to maximize your chances of conception. It clearly explains the basics of fertility charting to achieve pregnancy, the relationship between your hormones and your fertility signs, how to observe and record primary and secondary fertility signs and how to interpret your fertility chart. The current version has been expanded to include more frequently asked questions about fertility charting for conception and includes over 80 “real life” chart illustrations. 20 Early Result Pregnancy Tests, 20 Ovulation Strips OR 10 Early Result Pregnancy Tests and 10 Ovulation Strips. Click here for your FREE 30 Days Trial with no obligation to buy. After the 30 days is up you will be charged $39.95 per month and receive a new shipment every 60 days. If you decide the TTC Kit is not for you, you can cancel before the 30 days is up and keep the ovulation and pregnancy tests.